So what is it about the amber gemstone that makes it so popular? Is it the insects inside it? Amber is fossilized tree resin, which has been appreciated for its color and natural organic beauty since the stone age. Because it originates as a soft, sticky tree resin, amber sometimes contains animal and plant material as inclusions. 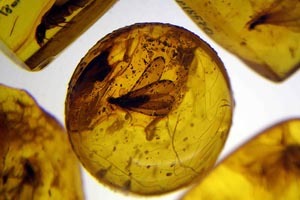 In recent times , the popularity of amber increased significantly due to the film Jurassic Park, where dinosaur DNA extracted from a mosquito trapped in amber in the film. Amber occurs in a range of different colors. As well as the usual yellow-orange-brown that is associated with the color "amber", amber gemstone itself can range from a whitish color through a pale lemon yellow, to brown and almost black. Other more uncommon colors include red amber (sometimes known as "cherry amber"), green amber, and even blue amber, which is rare and highly sought after. Much of the highle sought amber is transparent, in contrast to the very common cloudy amber and opaque amber. Opaque amber contains numerous minute bubbles. This kind of amber is known as "bony amber". The two main sources of amber on the market today are the Baltic states and the Dominican Republic. Amber from the former is older, and thus preferred on the market, but that obtained from the latter is more likely to have insect inclusions. The exact origin of amber is still a mystery. The oldest amber recovered dates back to some 320 million years ago. The oldest amber with insect inclusions comes from Lebanon and Jordan and dates back to roughly some 132 million years ago. This amber is of high scientific value where new species of insects and spiders were recently discovered. Amber took on great value and significance to, among others, the Assyrians, Egyptians, Etruscans, Phoenicians and Greeks. It never completely went out of vogue since the Stone Age. Between 1895 and 1900, one million kilograms of Baltic amber were produced for jewelry.